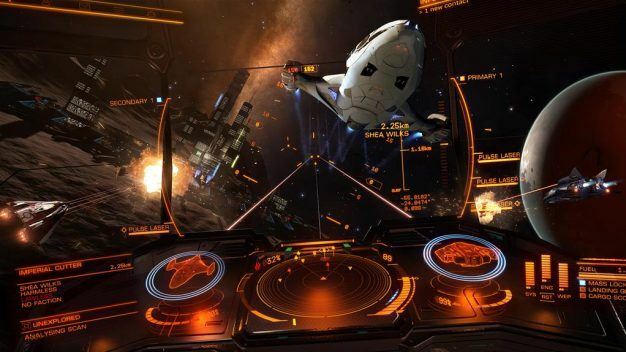 Elite Dangerous launched on the Xbox One way back in October of 2015 and I was really hoping that developers Frontier Developments would see it in their hearts to bring their seminal hit over to the PS4. Today my dream came true. Touch Navigation. Explore Elite Dangerous’ map of the Milky Way with a swipe using touchpad controls that make navigation fast and easy. Extra Control. Customize four additional touchpad ‘hotkeys’ to suit your own play style. Fast Headlook. Quickly track your enemies in the heat of combat with optional motion-based headlook controls powered by the DUALSHOCK 4 wireless controller. If you are lucky enough to own the powerhouse PS4 Pro, you will also benefit from enhanced performance as well as having the ability to choose between two graphics settings: Quality, favoring visual fidelity; and Performance, favoring high framerate. Play Your Way. Fight. Trade. Explore. Survive. Starting with only a small starship and a handful of credits, blaze your own trail in a cutthroat galaxy and earn the skill, knowledge, wealth and power to stand among the ranks of the legendary Elite. Customize your ships, build a fleet and live a complete life on humanity’s galactic frontier. A Hard Science Galaxy. From outer space to the surfaces of worlds, Elite Dangerous uses real scientific principles to re-create the sights and spectacle of our own Milky Way galaxy at its true proportions, all powered by the most sophisticated simulation in video games. Massively Multiplayer. Experience unpredictable encounters as you cooperate and compete with players from around the world in the Milky Way galaxy of the fourth millennium. Journey alone or with friends in space and on planet surfaces. Player-Driven Narrative. In an age of galactic superpowers and interstellar war, every player’s story influences the unique connected gaming experience and evolving narrative. Governments are overthrown, battles are lost and won, and humanity’s frontier is reshaped, all by players’ actions. You can download the main game on the PlayStation Store for $29.99 or you can grab the Commander Deluxe Edition for $59.99.